The National Curriculum for English requires us to teach speaking and listening, reading, writing, spelling, grammar and punctuation. Throughout school children develop speaking and listening skills in a range of contexts including an emphasis on talk throughout the curriculum, role play, reading aloud and discussion skills. In order to develop the children’s confidence, clarity and awareness of audience, we ensure that the children are given many opportunities to participate in presentations and performances. The use of Standard English is encouraged at all times. At West Bretton we place significant emphasis on the teaching of reading, as we feel that being a fluent and confident reader makes learning across the curriculum more easily accessible and opens up opportunities throughout life for all children. Our aim is not simply to teach children strategies for reading, but to engender within them an interest in and a love of books so that they will become life-long readers and learners. We provide a literacy-rich environment, with attractive books and displays throughout school, a well-stocked library and a selection of quality reading books in each classroom. There is an emphasis on reading in a variety of ways and in different genres: independent reading, shared reading, guided reading, silent reading and peer reading. Every child has a reading-record in which they are encouraged to record what they have read and any relevant comments. Parents are also encouraged to listen to their child read regularly and make comments regarding their child’s reading and understanding in the reading-records. From Foundation Stage, our children are introduced to reading, through the Read Write Inc programme, in which children learn the main 44 phonemes (units of sound) in the English language and their graphemes (written letter patterns representing sounds). Read Write Inc is designed to enable children to rapidly blend sounds to make words (decoding) and to secure their understanding of a text by giving lots of opportunities to talk about the text with their teacher and peers, to answer questions and to interpret meaning and intention behind the words (comprehension). As reading tasks/books are appropriately matched to individual abilities and needs (differentiation), children are taught in smaller groups and will often leave their own classroom for the daily literacy lesson. In preparation for the Government Phonics Test at the end of Year 1, children are taught to recognise and read sounds in ‘non-words’, (eg taim, phimp), which gives them confidence when decoding unfamiliar words. Children’s reading development is evaluated on an ongoing basis by the teachers and teaching assistants, with more formal assessments taking place half-termly and, twice a year, using the Salford Reading Test. Right from the start, children begin to apply their learning by sounding-out and spelling words, writing sentences and using basic sentence punctuation. We encourage children to 'mark make' in Foundation Stage and this leads to them using letter strings followed by writing real words. When the children have completed the Read Write Inc programme, which for most children will usually be during Year 2, they move onto the Literacy and Language programme. This is a structured scheme which uses high quality, challenging texts to extend children’s reading experiences and develop their skills. A unit of Literacy and Language lasts for about three weeks, although this can be extended or shortened depending upon the response from the children. The basic structure is a reading week, a writing week and a non-fiction week. When a unit of Literacy and Language is not being used, literacy lessons are usually planned and taught through topic work or books, designed to make the learning and application of knowledge and skills meaningful to the children. 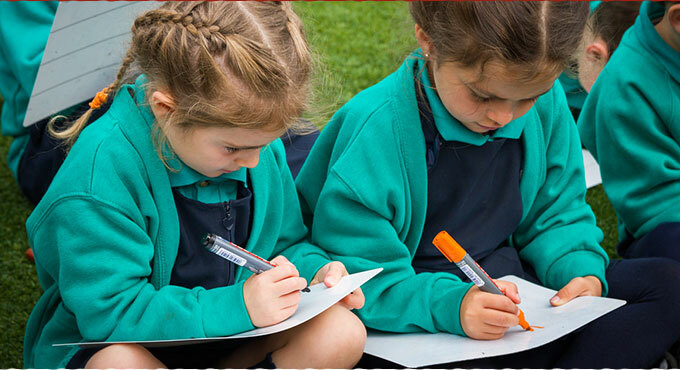 Children are given individual writing targets to help them to focus on their next steps for learning and, whenever the children are writing, they are expected to refer to their writing targets in order to help them to improve and move forward in their learning. In preparation for the national tests at the end of Key Stages 1 and 2, grammar, punctuation and spelling are taught systematically within each class, ensuring appropriate coverage and continuity, so that our children are confident and well prepared for the tests.